I hope you all had a great day yesterday if you celebrated the 4th of July. I hung out with my best friend and she invited my family over for a BBQ cook out. Although it rained and we stayed indoors to watch the Macy's fireworks, it was a wonderful evening full of good food and good company. Here is an Instagram post from yesterday's festivities! I've been binge watching the 90s tv show Friends for the past few weeks and it got me thinking about friendships. What really makes one happy--having a ton of acquaintances or a few really solid friendships? I did some research and put Google's Scholarly Articles to the test. I found out that science has shown that having a close interpersonal network of friends can make you happier in the long run! Here's some more findings and how you can apply this information to your own life. Improve the friendships you already have-by keeping your closest relationships in a good place. You may actually decrease your chances for illnesses, the common cold, heart attacks, and even lower your chances for obesity! Your friendships may also help promote brain health. Friends are a great way to keep functioning properly as you get older. In fact, an Australian study found that elderly people were 22% less likely to die if they had strong friend groups. 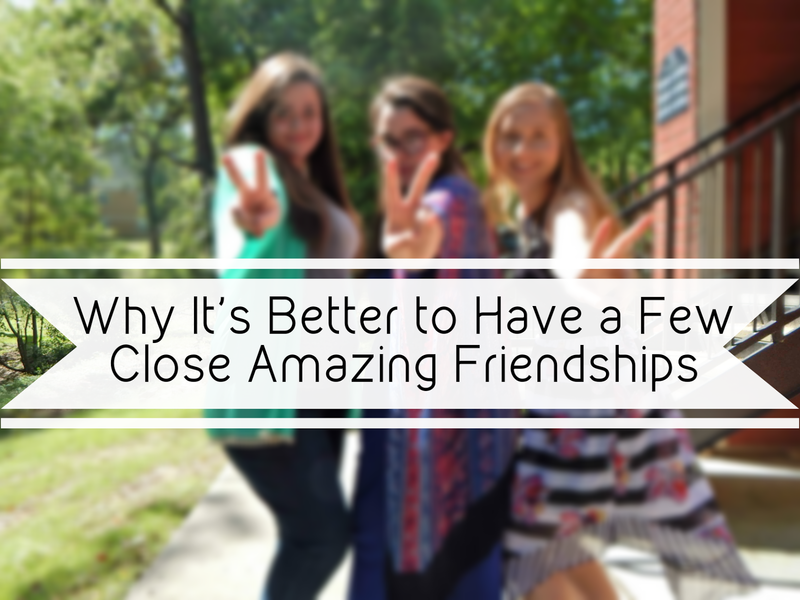 If you have 4-8 people you consider close friends, it might be more beneficial to strengthen those bonds instead of trying to find more people to add to your circles! Social media is not hindering the friendship process as much you think-People seem to be maintaining the same number of friendships throughout their lives even as time gets modernized. People are able to "keep up" with only a select number of friendships (I mean who really has time to talk to all 500+ of their Facebook friends on a regular basis!). According to a study at the University of Oxford, our "capacity for maintaining emotionally close friendships is finite". We may want to visually see a ton of friends on our social medias, but we can only keep a certain number of close friendships going. Growing up means losing friends-by finding out who your true friends are (like the ones you can call up and ask questions about laundry, cooking, or random things for example), and they are the people you can trust. When you grow up and finish chapters of your life, you may not see some people in it anymore. In my experience and opinion, if someone is not making you happy, you do not have to keep the friendship going! Here's my economic view: do the benefits outweigh the costs? How much time/effort/money/etc are YOU putting into the friendship? If you are not happy, you can change things. You have the power! Make room for someone else who will come along in time. Friendships are hard work! They are two way streets. They come and they go. For every friendship I've had I have been lucky enough to learn from the experiences and I am working on becoming a better friend to the wonderful people I have in my life. I let things get in my way too often and forget to reach out to my friends which is something I am working on! I hope this post helps you think about your friendships and can give some perspective! Such a cute look for the 4th lady!